Roger Reynolds, Pulitzer Prize-winning composer and professor of music at UC San Diego, has been appointed University Professor by the University of California Board of Regents. Reynolds is only the 36th UC faculty member since 1960 to be honored with the title – and the first artist. “This honor is reserved for scholars of international distinction who are recognized and respected as teachers of exceptional ability,” said Paul Drake, senior vice chancellor for academic affairs at UCSD. The purpose of the University Professorship is to recognize throughout the UC system the special talents of outstanding scholars and teachers. Reynolds joined the UCSD Department of Music in 1969. He became founding director of the Center for Music Experiment (now known as the Center for Research in Computing and the Arts, or CRCA), UC’s earliest organized research unit in the arts, in 1972. 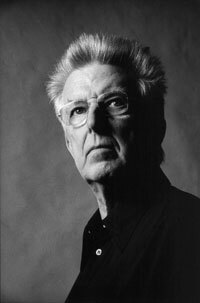 Reynolds was awarded the Pulitzer Prize in Music in 1989 for “Whispers Out of Time”, for string orchestra, and incorporating quotes from Beethoven and Mahler. He is credited with being the second experimentalist, after Charles Ives in 1947, to win the prestigious prize. Among the first American composers to make significant use of science and new technology, Reynolds continues to work at the cutting edge: In 1998, Mode Records released Reynolds’ “Watershed,” the first DVD in Dolby Digital 5.1 to feature music composed expressly for five independent channels of audio. He is also currently serving as the first composer-in-residence at the California Institute for Telecommunications and Information Technology (Calit2), where he is concentrating on “Sanctuary” and its malleable control of computer sound processing during performance. Premiered at I. M. Pei’s East Wing of the National Gallery in Washington, it is scored for percussion ensemble and real-time computer processing and spatialization. “Sanctuary” is scheduled for DVD release on Mode Records this winter. In 1998, the Library of Congress recognized his unique contributions to culture by establishing the Roger Reynolds Special Collection. Reynolds’ international presence is underscored by premieres at the Royal Albert Hall (London), Centre Pompidou (Paris), Suntory Hall (Tokyo), as well as at Carnegie Hall, Walt Disney Concert Hall, Kennedy Center, Lincoln Center and in such grand public spaces as the Library of Congress and the National Gallery in D.C., New York’s Guggenheim Museum, the Cité de la Musique in Paris and the Tange Gymnasium in Tokyo. His extensive catalog – numbering some 100 compositions – includes commissions from the Philadelphia, Los Angeles, Tokyo and BBC orchestras. Reynolds is also a prolific teacher and writer. He has written four influential books, beginning with the classic “Mind Models: New Forms of Musical Experience” (1975), which has been called, by composer and theorist Thomas DeLio, “an essential work for anyone who cares deeply about the music of our time.” His articles have appeared in Asian, American and European journals, and his music – recorded on Auvidis/Montaigne, Mode, New World, and Neuma, among others – is published exclusively by C. F. Peters Corporation, New York. Reynolds has served as resident composer at numerous international festivals, and his regular master-class activity in North American universities also extends abroad: from Thessaloniki, Greece, to the Sibelius Academy in Helsinki, Finland, and IRCAM in Paris, as well as to points in Latin America and Asia. Before beginning his career as a composer, Reynolds studied engineering physics at the University of Michigan and worked briefly as a systems development engineer in the defense industry. After earning his master’s degree in musical composition in 1962 from Michigan, Reynolds and his wife, Karen, began a seven-year migration through international hotbeds of today’s contemporary music – Germany, France, England and Italy, ending up in Japan. In 1969, he was lured from Tokyo to a tenured position on the fledgling UC San Diego faculty.